One of the best and hearty winter dish to have is a plate of steak. 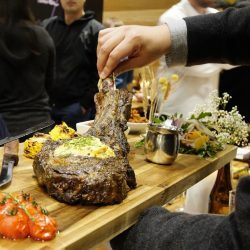 Brotzeit* took it to another level by serving us a platter showcasing a 30cm long Tomahawk rib-eye steak, slow-cooked for two hours with 12 different herbs and spices. This 1.3 kg meat was roasted to medium rare while retaining its tenderness and juiciness very well. 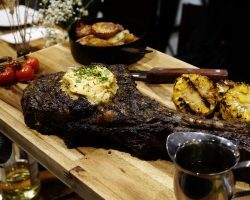 The Brotzeit Tomahawk platter comes with sweet corn cobs, yummy potatoes, cherry tomatoes, eggplant chili sauce, chili jam and fresh fennel orange salad. 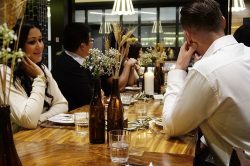 At $79 per person, this dish is enough to feed a group of four people. 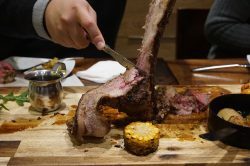 When the staff put down the star of the night, a platter of Tomahawk in front of us, we were all admiring the mouth-watering hefty slab of protein. 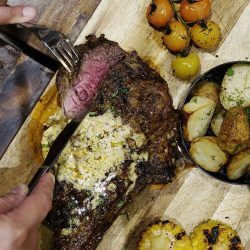 You will see a flood of spice rubbed gargantuan Tomahawk rib-eye steak on my Instagram because, to be honest, it was one of the best steak that I ever tasted. It wasn’t dry and tough, the size of the meat was justifiable when compared to the price tag. There was a certain satisfaction in each of us when we finished the Tomahawk really cleanly, without any meat attached to the bone. 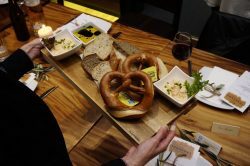 Before digging into the Tomahawk we were sharing the very delicious Brezn (Bavarian Pretzel) and bread basket filled with selection of bread. 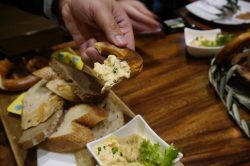 This platter came with very tasty salmon spread and Obatzda (cream cheese spread), all house-made at Brotzeit. 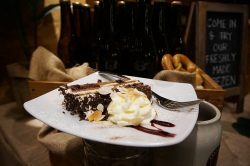 We finished the night with a slice of German’s black forest cake which came in perfect balance of cherry, cream and chocolate. The Tomahawk will be released at Brotzeit this Wednesday, August 24. When you make your reservation, don’t forget to state that you want to order the limited Tomahawk steak. I hope the Tomahawk steak will make a lasting impression for you as it was for me, now I can proudly say #ISurvivedTomahawk.